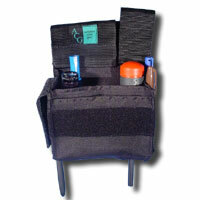 Strong and spacious pouch designed to hold the tools and accessories used by most Grip / Electric technicians. Features: Large main compartment, interior elastic loops, 2 side pockets, D-ring, metal gromet to allow for a screwdriver and outer C-Wrench holder with cover. Dimensions: 7" L x 6" W x 3" D.